Beached up on the north Northumbrian cliffs, we are exposed to all that the weather can throw at us. Over this winter so far we have endured violently squally and bad-tempered Southerlies bringing rain, rain and more rain. Recently the winds have changed to sea-salty and much colder Easterlies. But whatever the weather throws at us, we sit tight in our small sandstone cottage, and are good at keeping busy and toasty. My eye is always drawn out – when the grey allows ( and we’ve had a lot of grey this winter) – to Holy Island on the horizon, and to wonder how the monks there coped with the wind and the cold and the rain. We know about these monks because some of them were so exceptional, so saintly, that Bede (himself an exceptional early historian) recorded their history. In the early 7th century, King Oswald of nearby Bamburgh had summoned the monks from Iona to bring Christianity to his kingdom. It was St Aidan who stablished the monastery, and St Cuthbert was to follow there as bishop. We don’t have Bede’s histories alone to tell us about these early monks. We have inherited from this place and these early years one of the most remarkable and beautiful illustrated books of all time, the book of the Lindisfarne Gospels, apparently made by the later Bishop of Lindisfarne, Eadfrith, in honour of God and St Cuthbert. First page of St Matthew’s gospel. Image made available to the public domain by Wikipedia. These are the ruins of the monastery church on Holy Island today. Life in these buildings would have been hard and rough enough, but, in fact, these aren’t the buildings Cuthbert, Aidan and others knew. These are 11th century buildings. The early monks would have had oak buildings thatched with reeds. From the security and warmth of our windows, I often look out on Holy Island and wonder about the monks’ lives. And that manuscript – how on earth could the scribes do this skilled, delicate work in such bitterly cold conditions – no windows, remember? Hard lives. Hard and dangerous lives. Extreme danger, in fact, with the earliest known Viking raid on Lindisfarne in 793. Eventually (in 875) the monks fled, taking with them what they valued most: the body of their beloved St Cuthbert. A life-size wood carving in the church on Holy Island commemorates their journey. It gives a sense of the struggle to carry the coffin and body, but what of the panic, the fear, the gut-wrenching terror. From our small cottage we can see the sea and down the coast to Lindisfarne, and when there are large bonfires on Holy Island, we can often see their smoke too. Farmers here might have seen the approach of those terrifying Viking longships, or the smoke from their destructive fires. Skip through the generations to the 13th century, and people here endured a new menace: the Reivers. The Border lands, the ungovernable country between the separate kingdoms of Scotland and England, experienced years of lawlessness (right up to the Union of the Crowns in 1603) because of the depredations of the Reivers. Novels have been written and ballads sung of the Reivers, the wild lawless men who grabbed and took whatever they wanted – especially if it belonged to another family that they were at odds with. It was Sir Walter Scott who really put the Reivers on the map. His Minstrelsy of the Scottish Border established the tales of the Reivers as romantic, glamorous, and exciting. Actually, they were nasty, cruel and vicious. These Border lands were divided into six Marches, and Berwick lay in the English Eastern March. It was better governed than most. But it was bad enough. It’s not hard to find examples of defensive architecture. In our adjoining parish of Ancroft, the church itself had a secure tower to offer safety when the Reivers swept in. The walls are 1.35 metres in thickness, the upper windows are tiny. You can climb to the top of the tower, and there are fine views around. It might have been used as a look-out, and it’s possible warning beacons may have been lit from here. This tower is certainly no ecclesiastical adornment. Even in more recent times, life was miserably hard in these parts. Coal was mined under the neighbouring fields, and the tramway bearing coals to transport ships runs across our view ( it’s the uneven shrubby line of trees running from the top right of the landscape across to where it meets the modern Eastcoast Mainline running along the coast). In the local churchyard, there are several sad gravestones which tell of deaths at the colliery. One of them is for John Harbottle who was accidentally killed on the 21st November 1865, aged 45 years. We don’t know how he died, but you can read more on these accidents at Scremerston Colliery at the Durham Mining Museum webpage. No Health and Safety Inspectorate in those times. But of all the troubles in this part of the world, it was surely the sea that caused most grief. Just up the coast at St Abbs, these small statues stand as a reminder of the terrible cost of fishing disasters. These are the wives and children of Charles Purves and James and William Thorburn who lost their lives in the great storm of 1881. 189 fishermen from the east coast of Scotland perished in that storm. Another extremely dangerous (but potentially very lucrative) sea-faring enterprise was whaling. Berwick’s last whaling ship, the Norfolk, left on its last voyage in 1836. She sailed over to the North American coast in the spring, but come winter, found herself trapped by ice in Pond Inlet (of Baffin Bay) with several other ships. The Captain of the Norfolk recorded on 15th January 1837: “…The frost is very severe and the ice has been pressing to a great height all around us.” They did not escape the ice until mid-March. Many, many men died of scurvy as well as frostbite. One Berwick whaling-ship owner proudly announced his trade on his front door. Those are harpoon heads on the front door panels. 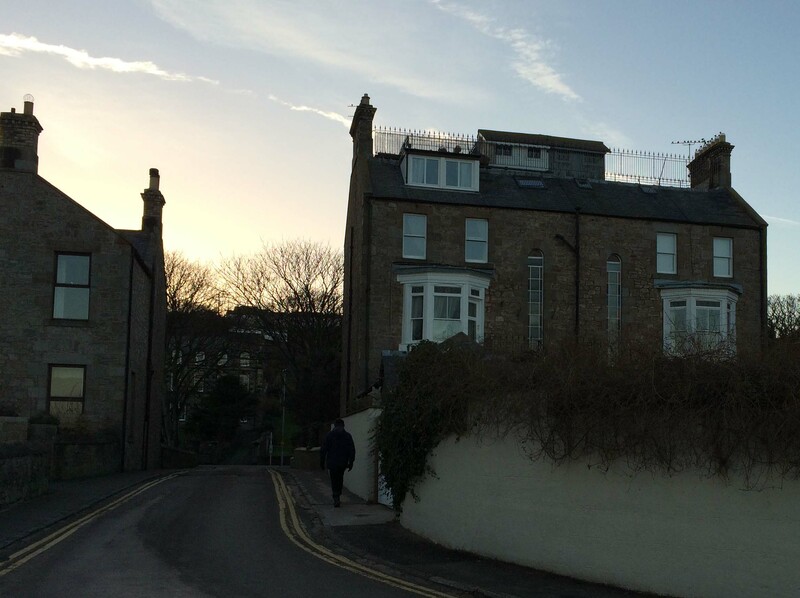 These balustrades on the roofs of local Spittal houses are sometimes know as widows’ walks. From them pacing wives and ship-owners might scan the sea, looking for sight of ships. The whale oil was processed in the manufactories where the last Spittal chimney now stands. It was a foul-smelling and obnoxious process. Is it surprising that people fled, leaving this beautiful area for places where they hoped they might have a better life? I am left to reflect on my twenty-first century luck to be living here, safe and warm and healthy – so as to be able to enjoy it in comfort. Oh, alas for all those poor souls who lived in these parts for whom life was such a miserable and dangerous struggle.